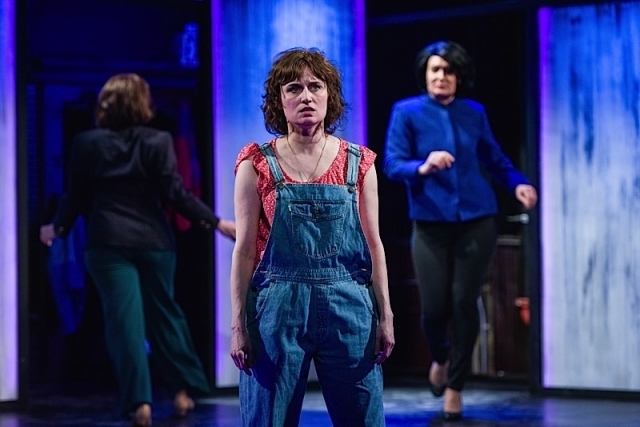 It is extremely rare to find a political play that accomplishes putting forth opposite views of an issue without siding with one side or the other, and which lives as a bona fide work of stage art rather than a debate. 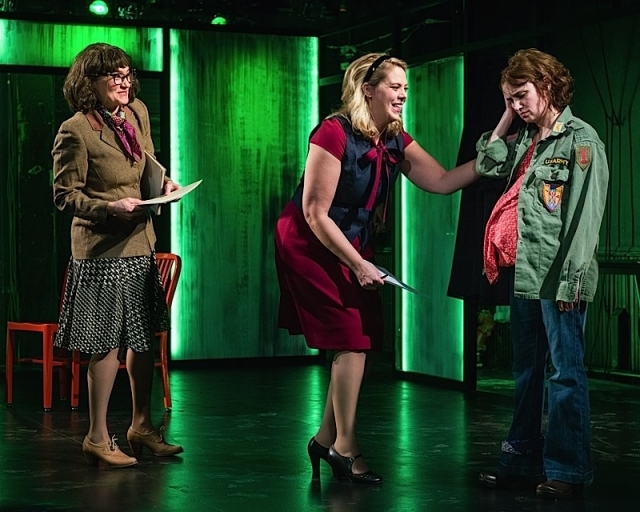 However, Roe, a new play by Lisa Loomer, scrupulously dramatizes the pro-choice v. pro-life standoff by relating the story of Roe herself, and her lawyer, Sarah Weddington. 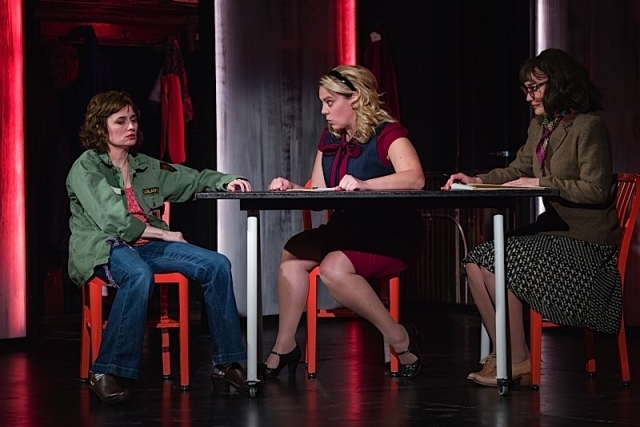 It crackles in a breathtaking production at Mixed Blood Theatre driven by two powerful dual lead performances from Tracey Maloney and Laura Zabel. As you may have guessed, “Roe” refers to the alias for Norma McCorvey, renowned for what is probably the most divisive U.S. Supreme Court decision of the past half century: Roe v. Wade, which made abortion legal in 1973. Loomer reminds us that McCorvey was a lesbian who loved her liquor and good times far too much and went on to convert to an Evangelical view of Christianity. As the play demonstrates, she was haunted by regret over being the catalyst for the SCOTUS decision. Her conversion was a result of this. Roe starts out with McCorvey (a viscerally dynamic Maloney) and Weddington (a stately and controlled, but likable Zabel) aggressively bickering with one another as to whose side of the Roe v. Wade legend is true or not. They soon agree that each will tell their own side. And then the breathtaking race is on! One of Roe’s challenges is that aside from the dual leads, it calls on most of the supporting players to play more than one role, some of which are pretty juicy. The pitfall with such a challenge is that so many scenes can come off like a comedy revue rather than a serious drama. However, gay director Mark Valdez has masterfully guided his actors to convey both the humor and the inner depth so that we are not allowed to take refuge in seeing them as caricatures. Within that mix, Michael Booth and Bonni Allen beautifully portray a married couple of faith from the anti-abortion crusade, Operation Rescue. The temptation is to reductively spoof them as holy-roller “deplorables”, but these actors give us flesh and blood human beings who have arrived at their convictions genuinely. This is enhanced by an endearing performance by Olive Middleton, as their young grade school-aged daughter. That said, there is definitely spoofing of famous celebrity feminist icons in one segment. The insinuation is that feminism has its own hermetically sealed hierarchy from which lower status women are not fully included, even the well-heeled Weddington to some extent. A deliciously flamboyant Kate Guentzel delights in a satirically self-absorbed representation of Gloria Allred. Ambulance chasing boosts lucrative careers in the name of gender justice. One of Roe’s most moving threads is the romantic relationship between McCorvey and the older Connie Gonzalez, played in a devastating portrayal by Lisa Suarez. There is an ironic moment of biblical dimensions when one character denies the other. Suarez not only evokes the steadiness of profound lesbian love, but she has also mined the heart of a woman who has questioned the all-or-nothing tactics of the pro-choice movement, as well as the sternly lesbiphobic religious strictures put forth by certain pro-life supporters. Also shining in various roles are a multifaceted Dame-Jasmine Hughes and a vibrant Sam Bardwell. A passionately intense Jamila Joiner brings a current day perspective from a younger woman. Patrick O’Brien is striking in the role of Henry Blackmun, the Supreme Court justice from Minnesota who wrote the court’s Roe v. Wade opinion. Roe is prescient because since it was planned to be produced at Mixed Blood, the controversial push for third trimester abortion launched by Virginia House Delegate Kathy Tran and given credence by Virginia Governor and physician Ralph Northam has catapulted the issue back into the headlines. 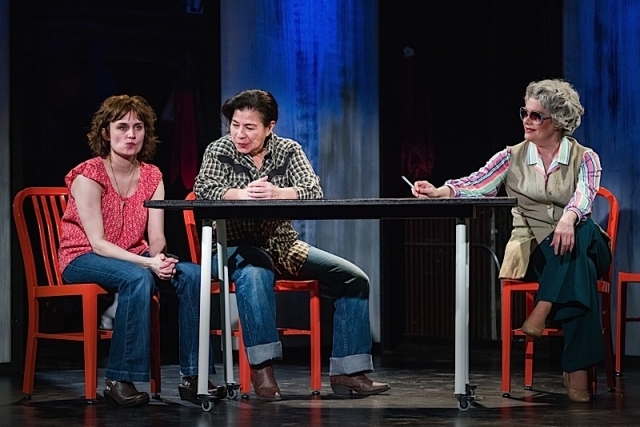 Roe, the play, is a terrific opportunity to acquaint or re-acquaint audiences to the history of the original SCOTUS opinion which continues to influence American and state politics. Loomer’s ear for both sides of the argument and the humanity behind the words of both sides is remarkable. Roe also makes for a unique Women’s History Month offering in that both liberal and conservative women are given a voice.